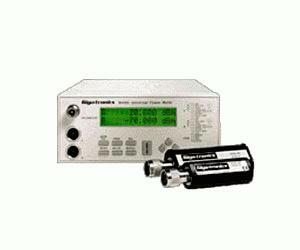 The Giga-tronics 8540C Series Universal Power Meters combine accuracy, speed, range and measurement capabilities unavailable from any other power meter. Built-in features such as power sweep calibration and frequency calibration factors provide an unequaled degree of measurement accuracy. Only the 8540C Series Power Meters have the speed and range to meet the throughput demands of high-volume manufacturing. And the meters can measure the CW, peak and true average power of the complex modulated signals used in EW, radar and communication systems. The power sweep calibrator uses a 50 MHz amplitude controlled oscillator to step from –30 to +20 dBm in 1 dB increments. Each step is set using an internal thermistor — the standard for accuracy and traceability. You get thermistor accuracy, plus diode speed and dynamic range, for measuring signals accurately over a full 90 dB power range. Giga-tronics 80300A Series CW Power Sensors let you measure CW power from10 MHz to 40 GHz at speeds up to 500 readings per second over GPIB. Measure up to 90 dB with a single sensor, and select from a varietyof high power sensors, up to 50 W.
Attach a Giga-tronics 80350A Series Peak Power Sensor to an 8540C meter and directly measure the instantaneous peak power level of a pulse modulated signal. The Giga-tronics 80400A Series Modulated Power Sensors let you measure the true average power of amplitude modulated, burst modulated and other complex modulated signals — such as TDMA signals — at modulation bandwidths up to 40 kHz. When greater bandwidth is needed — for formats such as CDMA and PHS — Giga-tronics 80600A Series Modulated Power Sensors provide bandwidth up to 1.5 MHz to measure the true average power of complex modulated signals.